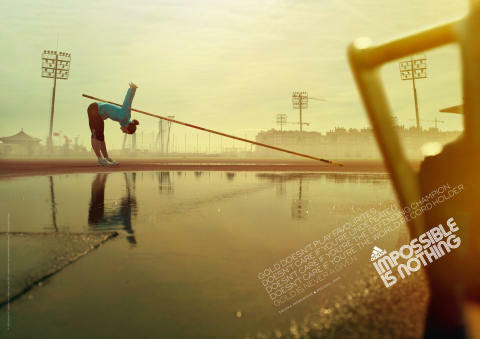 Adidas has come out with a print advertising campaign featuring Olympic competitors reflecting on gold. 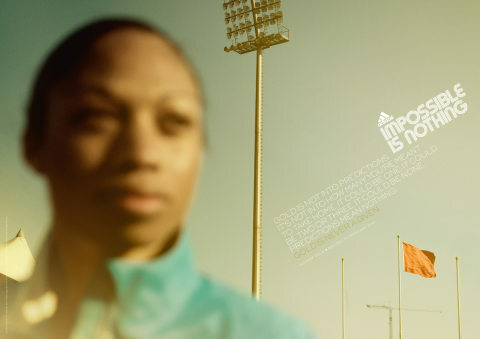 In early February 2008 Gus Powell and Paulo Martins captured six athletes on film in Beijing and Valencia, picking up the sunless ambience of the Chinese air. 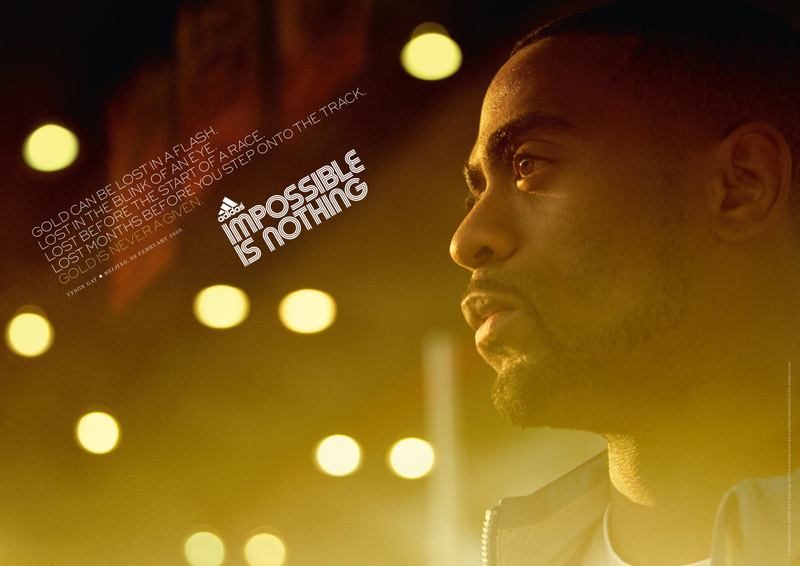 Six athletes are shown: American sprinter Tyson Gay, American track and field sprint athlete Allyson Felix, Jamaican track and field sprint athlete Veronica Campbell-Brown, American track athlete Jeremy Wariner, Russian pole vaulter Yelena Isinbayeva and Ethiopian long distance track and road running athlete Haile Gebrselassie. 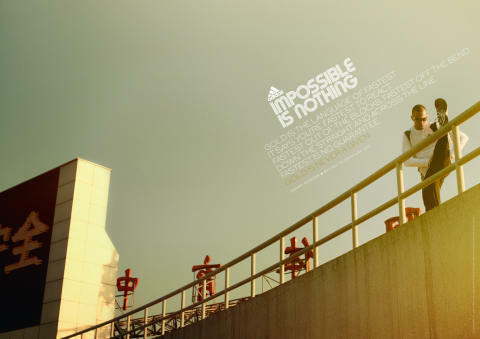 Each lives in the tension between “Impossible is Nothing” and “Gold is never a given”. Gold can be lost in a flash. Lost in the blink of an eye. Lost before the start of a race. Lost months before you step on a track. Gold is never a given. Tyson Gay, Beijing, 8 February. Gold makes you wait, makes you wait four long years, four long years of training and more training. Four more years of waiting for your chance. Gold is never a given. Veronica Campbell-Brown. Beijing 08 February 2008. Gold doesn’t play favourites. Doesn’t care if you’re undefeated. Doesn’t care if you’re the defending champion. Doesn’t care if you’re the world record holder. Gold is never a given. Yelena Isinbayeva. Beijing 2008. Gold is not into predictions. It’s not into how many you’re meant to take home. It could be one. It could be two or three. It could be none. Predictions mean nothing. Gold is never a given. Allyson Felix. Beijing, 08 February 2008. Gold is more than a colour. It’s a dream to keep chasing. It’s a dream to keep you going. It’s a dream that sometimes gets put on hold. Gold is never a given. 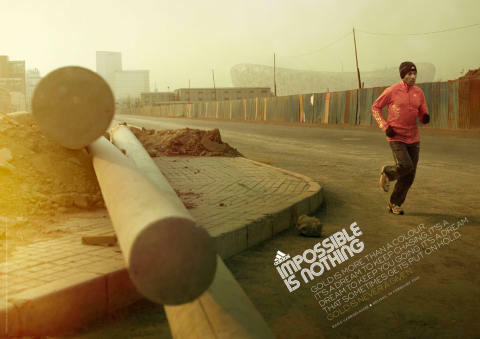 Haile Gebrselassie. Beijing, February 08 2008. Gold is the language of fastest. It says you’re fastest to react. Fastest out of the blocks. Fastest off the bend. Down the straight and across the line. Fastest is no guarantee. Gold is never a given. Jeremy Wariner, Beijing 08 February 2008. 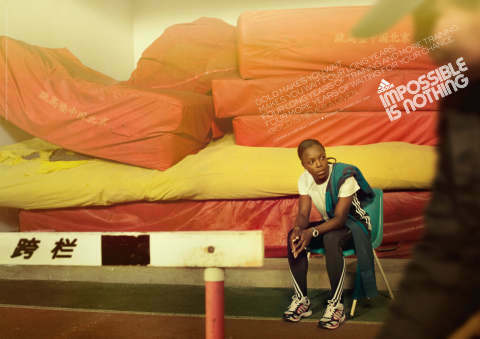 The Adidas Olympics Gold is Never a Given campaign was the responsibility of Adidas Global Brand Communications team Kieran Riley (director), Karen Zuccala (manager) and Claudia Ummenhofer. The concept was developed at 180 Amsterdam (180\TBWA) by creative director Dean Maryon, Paulo Martins, Carlos Furnari, business director Geoff Coyle, account manager Caroline Britt, planning director Andy Edwards, and business affairs manager Kindra Schoemaker, senior print producer Marlon Lee, executive producer David Corfield, project manager Piers Bebbington. Photographers were Gus Powell and Paulo Martins (for Yelena Isinbayeva in Valencia). Art buyers were Kristina Florén and Maria Perez (for Yelena). Also involved were graphic designer and studio artist Emile Wilmar and 2D Productions.